Middlesex's highest achieving students have had their hard work recognised at the University's annual Scholarship Ceremony. 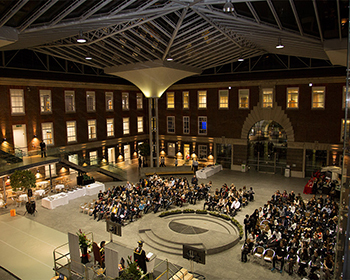 The Rickett Quadrangle at the Hendon Campus was packed with staff, friends and family last night (12 November) to applaud the many students from across the University's six schools who were presented with scholarships by Chancellor Dame Janet Ritterman. 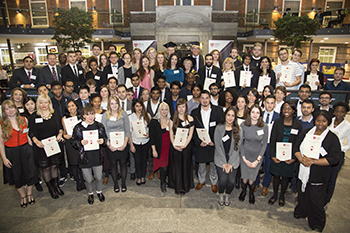 A range of scholarships were given out including 12 Lord Sheppard Awards – two from each School – and six Santander Entrepreneurship Awards, all of which were generously sponsored by donations. Individual winners included BA Marketing student Inayat Patel, who received the Michael Rosen Prize for Marketing. Commenting on his award, Inayat, who when his not studying works on the Student Engagement Team in the University's marketing department, said: "This is testament to the fact that hard work and commitment does not go unnoticed at Middlesex." Another high achiever presented with a scholarship was Iakovos Loukas, whose jazz quartet provided the music for the drinks reception and dinner that bookended the awards ceremony. Drummer Joe Dessauer was also on hand to provide the accompaniment to a contemporary dance performance choreographed by BA Dance Studies student Alexandra Henwood. These performances underscored the depth of talent at Middlesex and this was something Deputy Chief Executive Melvyn Keen, who announced the awards, emphasised during his welcoming address. "Middlesex students are incredibly talented and it is one of the privileges of my role to hear about the wonderful range of things that our students achieve while they are here and what they go on to achieve after graduation," he said. In her closing remarks, Dame Janet highlighted the significance of receiving a scholarship. "Being an award holder is something special. It's singling you out as someone to watch; a rising star; a possible leader in the future," she told the student winners. "They don't just recognise past achievements, they are an investment in your future."